Editor's note: The following is a transcript of President Claire E. Sterk's address at her formal inauguration ceremony, held Feb. 8, 2017, in Glenn Memorial Auditorium. Thank you, Chairman Morgan; members of the Board of Trustees. I am very honored by the presence of Emory’s faculty, staff, students and alumni; I am grateful for the presence of distinguished civic and community leaders, delegates, speakers and performers. I am indebted to Emory’s past presidents, especially those seated on the platform today: James Laney, William Chace, and James Wagner. Thank you for all that you have given to Emory and for your gifts to me personally — your guidance, inspiration, and encouragement. I am delighted by the presence of mentors, former students, and friends. The presence of my relatives, sitting close by, provides great comfort. I want to recognize my husband Kirk Elifson—wise friend and caring partner and somebody who makes me pull weeds. Today we celebrate an institutional rite of passage. We do so with excitement, determination, and optimism because of our faith in and hope for Emory. The opportunity to lead Emory in this moment of its history is a tremendous honor. It also brings an equal share of responsibility. I am humbled by the confidence that so many of you place in me. Most of you do not know that as an adolescent, I pictured myself one day as an orchestra conductor. When no one was around, I would pick up my baton and with the help of at least one hundred imaginary musicians, translate my vision into a glorious sound. Given that I am standing before you today, I believe that in many ways I have received a role that resembles my adolescent dream. I relish inspiring people to collaborate and to make the whole greater than the sum of its parts. I am inspired by listening to all voices and harmonizing those into an inclusive community – a community with focus and intent and based on mutual respect. The inauguration of a university president is an infrequent occasion in the history of the institution. Inauguration brings together all parts of our university so that we can celebrate together. For some of us, it is also an opportunity to wear our regalia! From my vantage point, you look fabulous! More seriously, though, since a university inauguration does not happen often, it offers a moment of meaningful reflection – a time when we consider the institution’s past, take stock of the present, and envision the future. Inaugural traditions remind us that universities are enduring institutions. At Emory, nineteen men have taken the presidential oath before me. They have led in times of war and peace, prosperity and recession, comfort and adversity. No matter the circumstances, each of them remained true to Emory’s motto: The wise heart seeks knowledge. At today’s inauguration, we renew our commitment to Emory’s reason for being. Dad passed away five years ago, and now dementia has altered the ways in which I connect with my Mom. Nevertheless, I feel my parents’ presence today and I am grateful for the lessons they taught me, for these align beautifully with the lessons we learn and teach at Emory: lessons for living, for caring, for courage, and the value of knowledge, preservation, and inquiry. Lessons that are rooted in a history of bold actions, inspired by the motivation to serve humanity. It all began in 1836, when a small group of Methodists founded a new college, naming it for John Emory, an American Methodist bishop who imagined an education that molded the character as well as the mind. They also created a new town and called it Oxford. This was quite a bold action on their part. Today that college is Oxford College of Emory University. During the early part of the 20th century, the ambition of the Southern Methodist Church to create a new university in the South came to fruition when Asa Griggs Candler offered one million dollars and 75 acres of land in the Druid Hills neighborhood. In 1915, DeKalb County granted a charter to Emory University. Throughout the 20th century, Emory continued to take bold actions, actions aligned with its purpose of contributing to society. Our doctors and nurses staffed the Emory Hospital Unit on European battlefields during both World Wars. In fact, a naval cargo ship was christened the M.S. Emory Victory in honor of the university’s contributions in France and Algeria during the Second World War. Emory’s resolve kept pace with historical events in society at large. The opening of doors to women began at Emory in 1917, and the first female graduated in 1920, the year when American women were finally guaranteed the right to vote. The long struggle for civil rights in the United States was mirrored by vigorous debate on the Emory campus. The university began admitting students regardless of race or color in 1962. The path to racial integration at Emory was not without controversy, resembling debates we face today about access, inclusion, open expression and support. Emory has a history of fighting for social justice, while also recognizing that as an institution, as a community, we sometimes fall short. But the questions we must ask change over time and are driven by the larger context of our society and our world. Let me briefly share some key questions that currently are on my mind. What are the roles and responsibilities of research universities? How do we bring institutional history, capacity, and values into addressing contemporary social, economic, and cultural challenges? How do we lead during times of transformation in higher education—or, for that matter, times of dramatic transformation in the world at large? How can we nurture global innovation and discovery that are guided by ethical leaders? How can we improve health and reverse the heavy toll of preventable diseases around the world? How can we foster respectful, ongoing dialogue in a divided society? The research university’s obligation to society is ingrained in the very reason for its being— “service to humanity.” Emory has the responsibility to contribute to society, to prepare inquiring minds, to develop moral leaders, and to contribute to addressing contemporary problems, to help solve these. Research universities must continue to earn the public trust. We must be faithful stewards of that public trust. This, Emory will continue to do. We cannot afford to be complacent – nor will we be. From my first day on the job, about five months ago (although it feels like longer than five months, I have to admit), the call for action has been loud and unmistakable. An emerging theme in the feedback from members of the Emory community is that of our shared responsibility to the world. That is not an easy obligation to fulfill during times when society is fragmented, whether close to home or around the world, and during times when interactions are contentious. Despite this climate I am hopeful about the future because I know what the people at Emory are capable of accomplishing. We will be guided by what we stand for: knowledge, the pursuit of truth, evidence, rational reasoning, and ethical principles. Our past demonstrates that with the right people aligned behind a common purpose, we will forge a future worthy of our ambition. As Emory's president, I will proudly stand with our staff, faculty, students and alumni to clearly articulate and demonstrate what we stand for. I am encouraged by and committed to Emory's core values of inclusion, compassion, collaboration, integrity, optimism and boldness. I share these values and I will forcefully represent them. As we look into that future, I want to share three commitments that I am making to you, and I hope that you will adopt these as Emory’s commitments. First is the commitment to move Emory from a diverse institution to a more inclusive one — from being a gathering of different people to being a real community that actively welcomes the voices, strengths, and contributions of all, recognizing that our very differences strengthen us. We will transform our culture, and thereby enhance our contributions to society. Second is the commitment to engage in the broadest and deepest ways globally — beginning around the corner in our city, county and state. This is how we will bring lasting and positive change, while also enabling Emory’s students and faculty to grow intellectually and personally. Emory’s location in Atlanta reinforces our responsibility as a global research university, a university located in a city and region that is our gateway to the nation and the world. 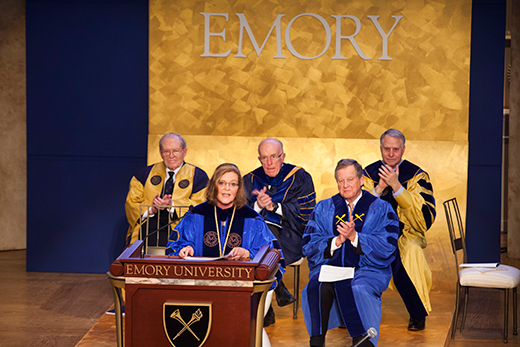 Third is the commitment to lead by employing Emory’s enduring qualities of excellence, distinctiveness, and relevance. These qualities will enable us to signal the way through the rapidly changing landscapes of higher education and health care, as well as of society at large. It includes a commitment to leading by enrolling and graduating students who will excel, and by offering an optimal student experience. Leading by attracting and retaining eminent faculty and staff, whose integrated knowledge, scholarship, and creativity will contribute to society. Leading by being focused on the common good and the moral responsibility we have. Today affords me the great privilege of sharing with you some of my story, and I am grateful for such attentive listeners. But this is also an opportunity to share Emory’s story. In the noise of today’s world, to stand out and to be heard, we must not shy away from attention, but instead take every opportunity to proclaim what we stand for, to note the contributions we make in serving humanity, and to celebrate the impact we have in the world. A quote attributed to Abraham Lincoln, who was president of the United States when Emory College was just a quarter of a century young, reads as follows: “Character is like a tree and reputation is like its shadow. The shadow is what we think of it; the tree is the real thing.” We must ensure that the reputation of Emory, the way in which the world perceives this great university, is consistent with the real thing. We need to help the world see and appreciate our deep and nurturing roots, our substantial and solid trunk, and its widespread and flourishing branches. I have just described ambitious commitments and transformations to you. Ambition is not new to Emory. It is at the core of our history and it will be part of our future. Just as my parents taught us that “if we are willing to be open to others, the most beautiful things will happen," Emory will also be open enough for amazing things to happen. Now is the right time for Emory to seize its ambition. We will make the right choices and leap forward. And as the wise heart seeks knowledge, let’s use our place of privilege, of being this amazing educational, social and humane institution, for optimal impact.